Well, to take care of the lashes part there is a set of Eylure Naturalites Lashes. I don’t often wear false lashes because I find them annoying but these are fine because they are meant to look natural, simply boosting the lashes you already have. Next up is Emite Diamond Heart Primer. I had never heard of this brand before so it was a nice discovery. This one is an illuminating primer so it really works to brighten skin and balance skin tone. Great for skin prone to hyperpigmentation or if you just need a boost in general! I was really happy to see a Royal Apothic product in this box. This L.A. beauty brand is really cool and I love everything about them. This body cream is lovely – it smells nice and feels nice – especially for the winter months. And how cute is the packaging? I love the ‘Nutrition Facts’ on the side of the box which tells you all the key ingredients such as Safflower Seed Oil, Milk Protein, Lactic Acid (good for exfoliation) and Sweet Almond Milk. I have not yet tried a product from MUA either so was quite surprised to see this generous palette included in the box. This palette is really nice – it has 12 colours and the colours themselves are really great for everyday with the option of a darker colour (blue) to create a smoky eye. And last but not least who can resist a good lipstick? I haven’t tried a Revlon lipstick in so long and I’m ashamed to say I don’t own any in my collection at all but this Super Lustrous Lipstick is lovely – it goes on smoothly and doesn’t dry out lips. No wonder as it contains avocado oil and Vitamin E. The colour is a nice bright classic red which is suitable for just about anyone. And who can resist a red lippy after all? 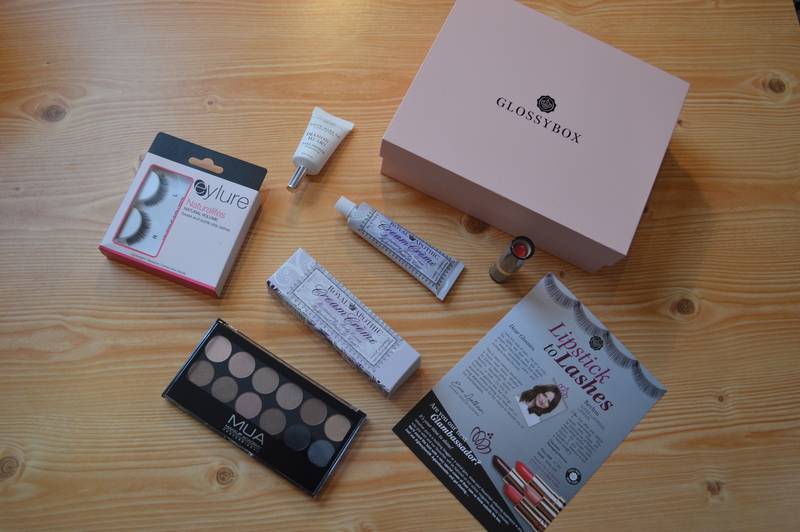 Glossybox subscriptions cost £10 per month and you can find out more information here.